Point! (Even if her eyes were closed. This girl asked Dominy to compete with her, so they both did not have to fight with the guys. Dominy said okay. Then the girl proceeded to dance around Dominy, and then lunged forward and tagged Dominy's nose. A little blood came trickling down, but Dominy did not care. Score 1-0 for the Blue Belt. 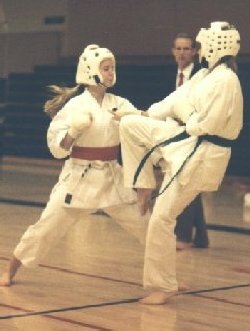 Next, Dominy lunged forward, accidentally steping and trapping the girls lead foot, and caught with a 'goju' punch to the chest. Goju stands for hard/soft. This was definitly hard. 1-1. The girl must have said whoaa, who is this girl, because she got pretty cautious. That was her undoing, as Dominy scored the next two points, winning first place in the AAU Regional Championship in Louisiana. This from a sweet, innocent little girl. Dominy receiving a certificate from Master Higaonna after one of our Gashukka's.